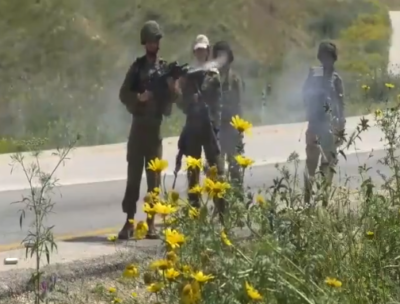 Israeli soldiers stationed in the Jordan Valley – a Palestinian area that is under Israeli control under the Oslo agreement – attacked a group of Palestinian hikers who were on a hiking trail near Ein al-Hilweh on Wednesday afternoon. The soldiers first fired tear gas and stun grenades at the hikers, then abducted seven of them, including two women. The hike had been organized by the Palestinian Authority, which was trying to both expose Palestinian residents to the natural beauty of the Jordan Valley, and expose the Israeli takeover of these areas through illegal colonial settlement and military force. In the Jordan Valley, known as the breadbasket of Palestine, there are a number of hiking trails and scenic areas. But they have been dead-ended and cut off by Israeli settlements constructed on stolen Palestinian land in the area. According to Mutaz Bisharat, the Palestinian Authority official who monitors settlement activity in the Jordan Valley, in addition to the seven detained, a number of other hikers suffered from tear gas inhalation. The Palestinian human rights organization Al Haq has written about the Jordan Valley, “The Jordan Valley comprises over a fifth of the territory of the West Bank and contains vital land reserves for the natural expansion of Palestinian towns and cities. It has abundant water resources – including one-third of the underground water reserves in the West Bank – and has vast potential for agricultural, industrial and tourism industries. The economic development of the Jordan Valley is considered essential for Palestinian growth and recovery and is therefore crucial for the sustainability and viability of an independent Palestinian State.